If English Canada ever wants to break out of the literary doldrums in which it all too frequenly finds itself mired, it would do well to stop casting its eyes wistfully back at a nostalgic era of cultural nationalism in the 1960s and ’70s – the period responsible for the first wave of what has become known (derisively in many circles) as CanLit – and look toward Quebec. For several successive decades, French-language publishing in that province has been responsible for some of the most eclectic and boundary-pushing literature being produced anywhere in the country, with only a fraction of it currently available in English translation. This hesitancy among English-language publishers is, on one hand, understandable: by and large, readers are as reluctant to pick up a work with origins in a different language as cinema-goers are to plunk down money for a subtitled movie. (To overcome this obstacle, some less-than-forthcoming publishers refrain from including the translator’s name on the covers of books in translation.) On the other hand, the sensibility coming out of Quebec will appear foreign – in various senses of the word – to readers more comfortable with literature steeped in English Canada’s dominant mode of straighforward naturalism combined with a traditionally well-made story. 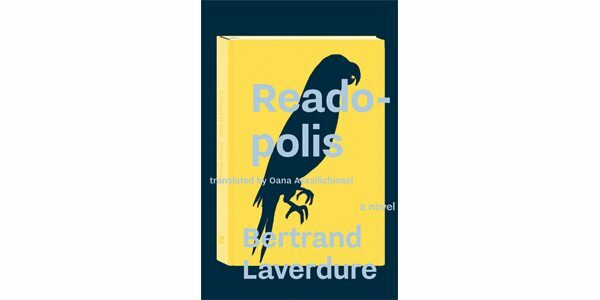 What might a typical anglophone reader be expected to make, for instance, of Readopolis, by Montreal poet laureate Bertrand Laverdure? Writing about an earlier translation (also from BookThug) of the francophone author’s novel Bureau universel des copyrights, J.C. Sutcliffe calls Lectodôme “one of Laverdure’s most accessible yet exuberantly intellectual works,” and while the latter part of that statement is clearly accurate, the former must be understood in relative terms specific to the author in question. Virtually plotless and told in a postmodern, hyper-self-reflexive manner that incorporates everything from email correspondence to mock screenplay dialogue to an extract from an imagined novella (complete with its own copyright page), Readopolis is a stylistically ebullient interrogation of the effect that literature has on the readers who consume it. The language of capitalism is unavoidable: our protagonist, Ghislain, is a member of the editorial board at a Montreal publisher, and three days a week he works as a cashier at the Couch-Tard convenience store beside the Joliette Métro station. This he calls “a lousy second job that lets me feel sorry for myself,” but it also exists “so I can honour my obligations as tenant and my small pleasures as cultural consumer.” Ghislain is a dedicated, not to say obsessive, reader whose “fridge is half empty” – a perpetual reminder of the meagre remuneration that accrues to the ideologically pure pursuit of literary endeavours. For Ghislain, this ideological purity falls somewhere between the spiritual and aesethetic domains – the realm of “readopolis,” in which the practitioner enters “a complex state of concentration that enables us, by decoding a series of written or printed letters, to reproduce at will the sense of being detached from the world.” Here, Laverdure can be seen aping the poststructuralists (Derrida, Barthes, Foucault) who, in the words of David Foster Wallace, “see literary language as not a tool but an environment.” This is the environment to which the reader must surrender in Readopolis: a malleable, protean world of linguistic play that slips in and out of reality, often over the span of a few sentences. Laverdure is playful in the extreme, including lists of fictional titles that were predictable in the years preceding their publication; a novella (alluded to above) in which writers of a certain stature are rewarded with the authority to kill their critics; and an extended footnote that imagines an inconceivable iteration of Oprah’s Book Club attended by apparently every member (living and dead) of the Québécois literary establishment. Doubling motifs proliferate throughout, including plentiful references to mirrors; a parrot who shares a name with the novel’s author; and a character called Hubert Lucrecios, a Chicago-based stand-in for Ghislain. Lucrecios works at a Barnes & Noble big-box store (where one of his colleagues gets sacked for disparaging the customers on social media) and runs a website called the Official Wizard of Books, on which he “spends his time scribbling his bibliophilic reflections into the void.” The Chicago setting is also appropriate: it serves as the nexus of middlebrow and highbrow literature, epitomized by Oprah at the former end of the spectrum and, at the latter, Saul Bellow (a Nobel Prize winner who was born in the Montreal suburb of Lachine). “How can anyone remain indifferent before this virtuosic assemblage,” Lucrecios thinks at one point, while contemplating a deconstruction of Caravaggio’s Narcissus. It is a question that is equally germane to Laverdure’s novel. Like the postmodern revision of Caravaggio’s painting – a study of a mythological figure who fell in love with his own reflection, now rendered as an accretion of “junk, old computers, nuts, bolts, bicycle parts, car doors, dirty furniture, old prints” – Readopolis presents us with a collage-like version of the reading experience, addressing the very effect that such an experience has on the reader who is undertaking it. Laverdure strikes a pose that is ironic and self-aware, and steeped in a virtually encyclopedic knowledge of Quebec’s literary history (in which defending Michel Tremblay is reserved for that “segment of readers born in the forties or fifties”). His novel is unlikely to appeal to a mass audience, but it testifies to the audacious energy and technical experimentation that continues to typify the literature coming out of la belle provence.